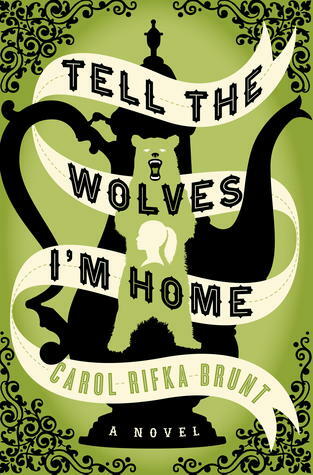 I recently finished the audio book version of Tell the Wolves I’m Home by Carol Rifka Brunt. This is a book I’m not sure how to review, but I can certainly recommend. It is the type of book that a plot summary won’t do the story justice. Tell the Wolves I’m Home is moving, emotional and a beautifully written debut novel. It is a book about love, about loss and grief and finding yourself through the loss. The relationships are complex, the characters are flawed and real. The main character, June, is caught in the transition from childhood to becoming a young adult. She is a romantic, happier in her imagination pretending to live in a simpler time than she is in the real world. I loved seeing and learning about the world through her eyes. But the death of her uncle Finn leads June to discover, like most teenagers eventually do, that her family is not perfect. The story is not only about June’s relationship with Finn, it is a story about siblings: June and her sister Greta; the girls’ mother Danni and Uncle Finn. I’m glad I listened to the audio book version because I was able to hear aloud the beautiful prose in which it was written. But I would love to read the book again just to highlight and underline those mesmerizing passages. 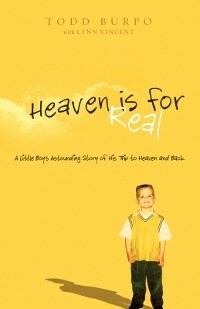 I also just finished listening to Heaven is for Real, a story about a little boy who undergoes surgery for appendicitis and afterward claims he has been to heaven. Over the weeks, months and years following his surgery, Colton tells his parents about his trip to heaven in the simple words and nonchalant tone of a young boy. I’ll admit I was skeptical going into this book and I was still a bit skeptical coming out. Colton describes heaven, and talks about meeting Jesus and John the Baptist. His parents are astounded at the stories he recalls from his trip to heaven and how closely they match scripture. What dilutes the story for me, is that Colton’s father is a pastor. Colton’s parents claim he describes things he couldn’t have possibly known, like the color of Jesus’ sash – but growing up within the church with a pastor for a father and attending Sunday School each week, I imagine a perceptive young child could pick up on certain things without his parents even knowing. But then there are things Colton couldn’t have known, like what his parents were doing while he was in surgery. Diluting it further is the fact that Colton’s father, Todd Burpo, is the author and narrator of the story, not Colton. By the time this book comes out, Colton is eleven years old, old enough in my opinion to tell the story himself perhaps with the help of a few adults. All of that aside, it was a quick and interesting read. After reading this, I have added Proof of Heaven to my To Read list. While the premise is the same, Proof of Heaven is written by a neurosurgeon who comes from a scientific, not a religious, background. This entry was tagged Audio books, Books, Recommended reading, What I'm Reading. Bookmark the permalink. I’m going to have to give Tell the Wolves I’m Home another try. I found the beginning slow and difficult to get into, but sometimes I’m quick to abandon a book if it fails to grab me right away. I’ve read lots of positive reviews about it. Thanks for a great post! Tell the Wolves I’m Home didn’t exactly grab me right away either and I can see how it might not be for everyone, but I’m glad I didn’t put it down. If you do finish it, I’d be curious to know what you think! After reading your blogs it makes me want to trun to the book store and buy the books! I’ve read I have read Heaven is for Real, and I have to say I walked away from the book with many of the same feelings that you had, yes I think kids will pick-up on things and the parents don’t realize and Colton should have written the book. Agreed, that’s why I’m interested to read Proof of Heaven. Same concept, but from a totally different (adult) perspective. Im waiting on Tell The Wolves I’m Home from the library it sounds amazing! I’d love to hear what you think once you’ve read it!